/ Destin Craft Beer / TACOS! TACOS! TACO TUESDAY ’til 5 & ROCK’N BINGO@7PM! 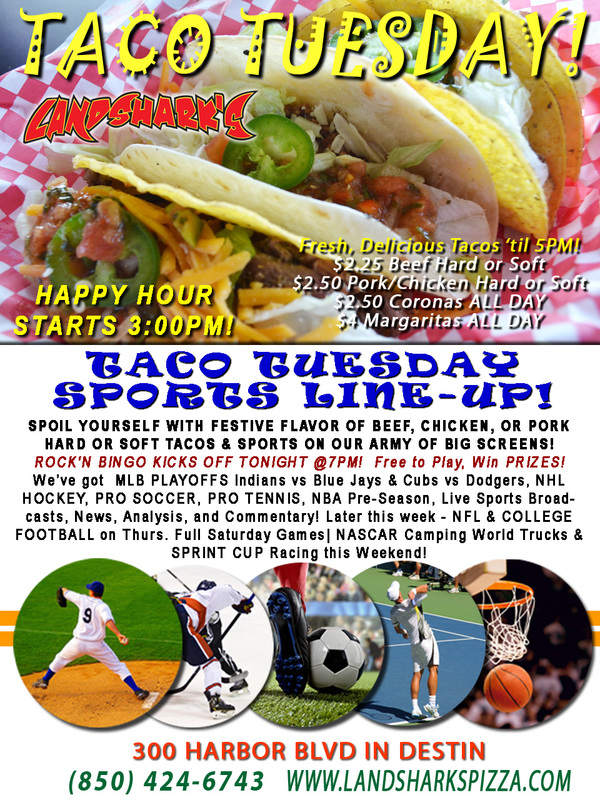 $2.50 CORONAS & $4 MARGARITAS! Happy Hour @3pm! TACOS! TACOS! 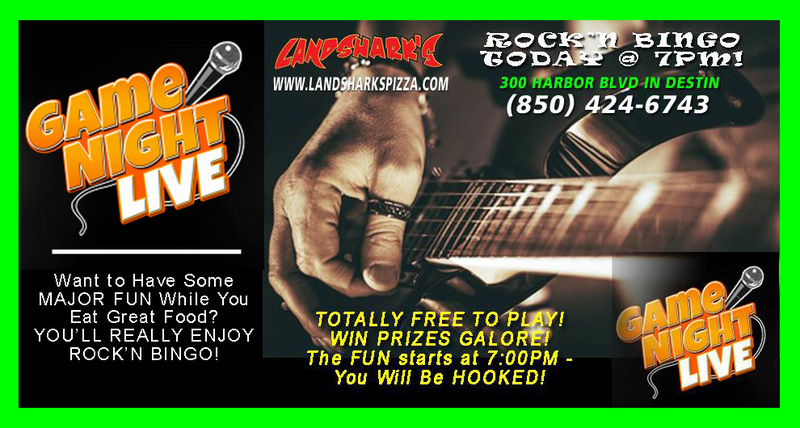 TACO TUESDAY ’til 5 & ROCK’N BINGO@7PM! 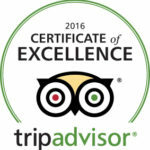 $2.50 CORONAS & $4 MARGARITAS! Happy Hour @3pm! 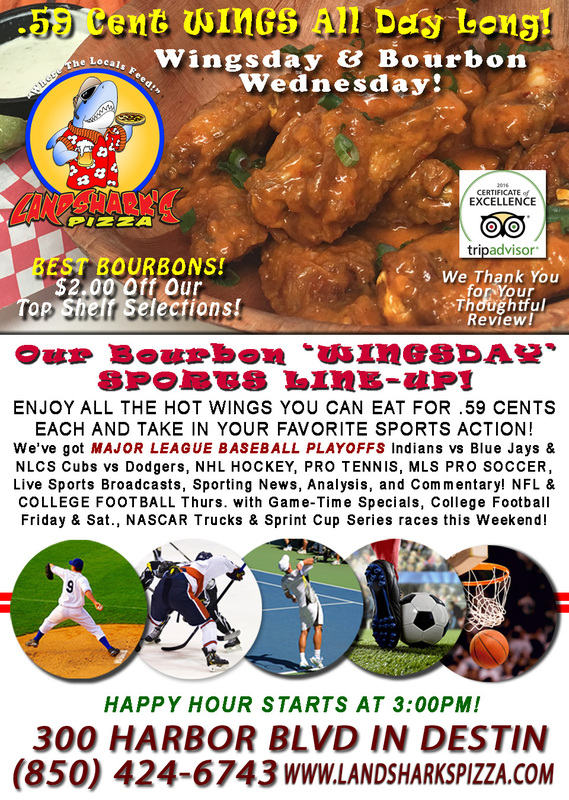 SPORTS ON OUR ARMY OF BIG SCREENS – We’ve got MAJOR LEAGUE BASEBALL PLAYOFFS Indians vs Blue Jays & Cubs vs Dodgers, along with PRO SOCCER, PRO TENNIS, NHL HOCKEY & Pre-Season NBA games today, plus plenty of other Sports Broadcasts, Sporting News, Analysis, and Commentary! PGA Tour This Week: CIMB Classic from Kuala Lumpur, which has to be somewhere near Crestview or someplace. Pro Tennis This Week: ATP Stockholm Open, ATP & WTA Kremlin Cup (yeah, THAT Kremlin), & ATP Euro Open! NASCAR This Week: Camping World Truck Series Fred’s Pharmacy 250 on Saturday from Talladega. Sprint Cup Alabama 500 at Talladega Superspeedway on Sunday. More NFL This Week: Thursday Night Football pits da PACKERS ‘gainst da BEARS! Full slate of SUNDAY games. Next Monday NFL features BRONCOS vs TEXANS. College Football This Week: Thursday is #14 Boise State vs BYU, Virginia Tech vs Miama, & more. Friday brings Oregon vs. California plus other college football action, and a full cornucopia of Saturday games on the way. Access our FULL ONLINE MENU by simply using your Mobile Phone when you go to our website or on Facebook using the ‘Menu App’ on the left hand side under Apps. 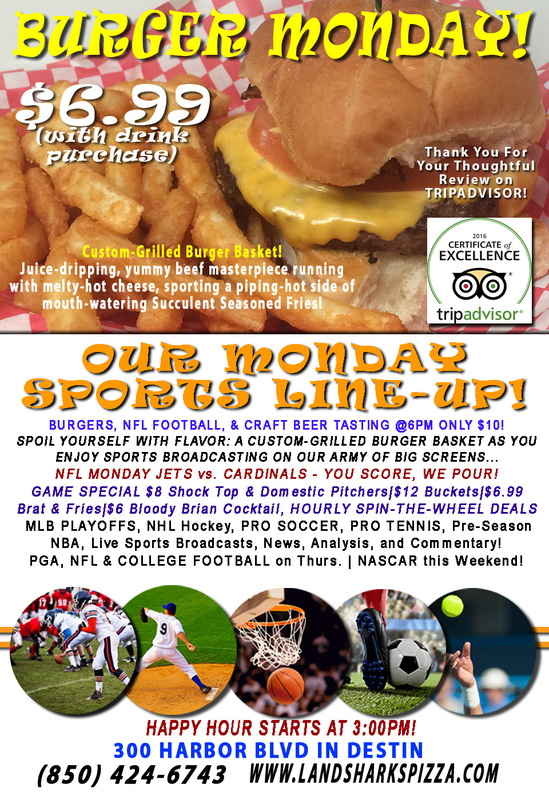 Previous Post: « NFL, Burgers, Brats & Brews $6.99 Grilled Burger & CRAFT BEER TASTING @6PM|JETS vs CARDINALS, YOU SCORE, WE POUR & MLB PLAYOFFS!